Do you love pho? I do. (Here’s a picture of me enjoying a bowl of pho at the Park Hyatt in Saigon). I could eat it every day for breakfast, just like they do in Vietnam. But our local Vietnamese restaurant doesn’t open until lunch, so I had to learn how to make it myself. The recipe that I use is printed below for your use. Mmmmm…. 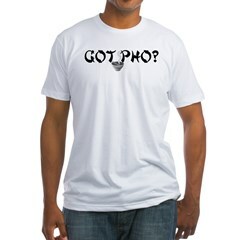 There are also a couple of pho t-shirts available through CafePress.com that show your love for pho (I have the ‘What the Pho?’ t-shirt and can’t wait to wear it down to breakfast at the swanky Park Hyatt the next time we’re there. In a 2 quart saucepan bring broth, ginger, star anise, and cinnamon to a boil. Reduce heat and simmer for 15 minutes. With a very sharp knife cut sirloin across the grain into very thin slices. In a large bowl soak noodles in hot water to cover 15 minutes, or until softened and pliable. While noodles are soaking, bring a kettle of salted water to a boil for noodles. Drain noodles in a colander and cook in boiling water, stirring 45 seconds, or until tender. Drain noodles in a colander. Set aside. Strain broth into saucepan and bring to a boil. Stir in fish sauce, salt and pepper. Add sirloin and sprouts and cook 30 to 45 seconds, or until sirloin changes color. Skim any froth from soup. Show your pride and impress your friends with this unique pho-themed t-shirt. Durable, high-quality, pre-shrunk 100% cotton t-shirt is what to wear when you want to go comfortably casual. Preshrunk, durable and guaranteed. Got Pho? Funny Pho, Asian t-shirts, sweatshirts, hats, kids clothing and more. 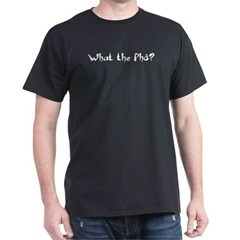 The ‘What the Pho?’, ‘Got Pho’, ‘I love Pho’ and other sayings are printed on a wide variety of t-shirts, sweatshirts, hats, kids clothing, bags, bibs at Cafepress. Just click on one of the ‘See More’ links above and then find the ‘pho’ link beside Home > Marketplace > pho to see all of them.